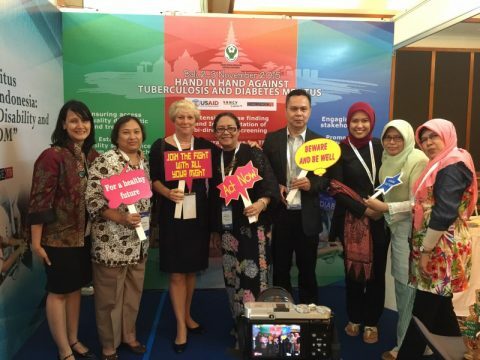 KNCV’s Chief Executive Officer Kitty van Weezenbeek together with National TB Program (NTP) Manager Dr. Christina Widaningrum and colleagues in the NTP/Challenge TB/KNCV booth, at the world’s first international Summit on TB and Diabetes in Bali. Health officials from the government of Indonesia, along with advocates, civil society groups, researchers and businesses from Asia, Europe, Latin America and North America are gathered for the summit in Bali, Indonesia on 2-3 November in an effort to avert a global health crisis. The summit is jointly organized by The Union and World Diabetes Foundation.